We had planned to go around the Black Sea clockwise, but with what was happening in the Ukraine in 2014 a circumnavigation of the Black Sea was not safe at all. As such, talks about alternative routes took place. After all the preparations are completed, we will start in Frankfurt Germany and then drive via eastern Europe to the Black Sea in Bulgaria. From there on we will go south east through Turkey heading to our actual goal GEORGIA. 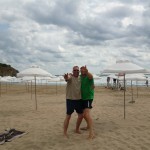 In Turkey we will follow the Black Sea coastline with some leisure days on deserted beaches, testing our new hammock. 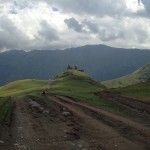 After crossing the border with Georgia we expect some decent off-road driving in the high mountain passes of the Caucasus mountains. 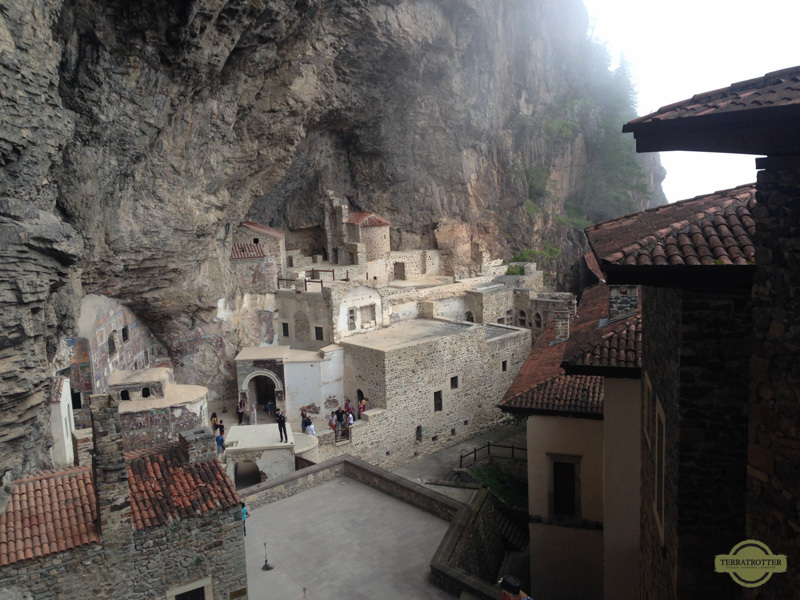 We will visit some remote Monastries and drink some exquisite Georgian wine. On our way back we will pass again through Turkey, but this time more inland. Our route runs via lake Van and the ancient region Cappadocia with Mount Taurus. Elmer and I will be driving in BlackRuby (Jeep Wrangler Rubicon Unlimited). Michael and Udo will drive a black Landrover Defender 110. Note: When we wrote about this trip we didn't know that it would become the prologue to a new life on the road and that we would start writing about it. As such this particular journal was more our own mental notes about where we had been and what we had done. It is the middle of the night. We arrive at a gas station in Hungary. This is our meeting point with two friends of Elmer, Michael and Udo, who will be joining us on this trip. They are running late, very late. So we have nothing else to do than to stare through the windshield at the blinking lights of the hundreds of windmills surrounding us and to come up with stories about invading aliens. What else can we do to keep us awake till 5 AM? When Michael and Udo finally arrive we celebrate our first day of the trip with a cold bottle of beer and then we are off to bed. Our first "night" in the popup roof tent... exciting! After a catnap of 3-4 hours and some Nutella sandwiches for breakfast we head to Romania. 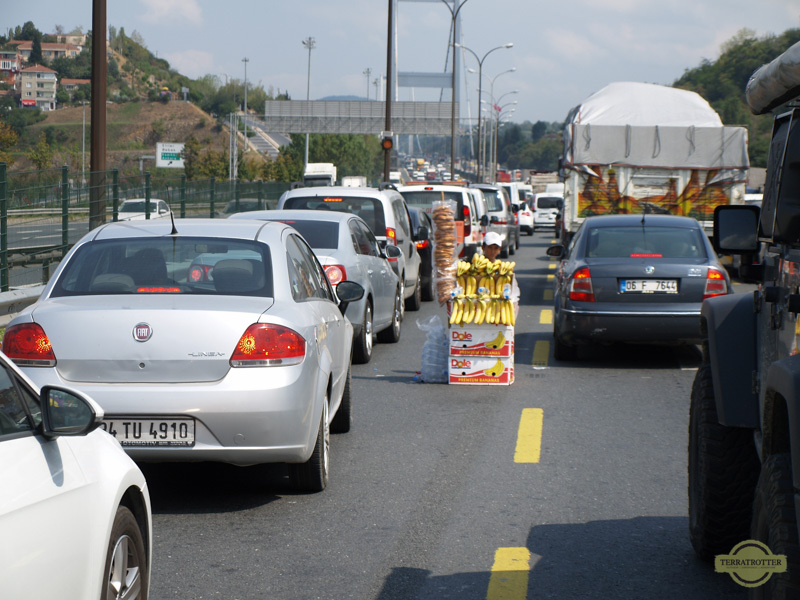 Romania requires the purchase of a road vignette. Instead of getting one at the border, we buy this at a gas station a few kilometers into Romania. During today's drive we first notice that our GPS maps are not as up to date as we thought. Romania's first highways are being build, but our navigation is not yet aware of this. Sadly, the countryside is rather depressing during this time of the year. We just missed the beauty of thousands of sunflowers in bloom. Instead we drive through seas of brownish farmland with few trees and many unfinished or desolated buildings. We do pass multiple opportunities to buy fresh vegetables and fruit on the side of the road. If only we had the local currency with us. In the evening we find a bush camp on the top of a hill by crossing a little river and following a road not really meant for motorized vehicles. The local farmer, walking by with his 2 cows, was probably surprised to find us there. Tip: If you can sleep with earplugs make sure you bring them with you on your road trip. More than once I was very pleased to have them (Elmer wanted me to add that he doesn't snore, ha), especially while spending the night in a tent on a gasstation. Note: What did we use to spread the Nutella on our sandwiches? My new Gerber LMF II Infantry knife, which I recently received as a birthday present but sadly arrived blunt. 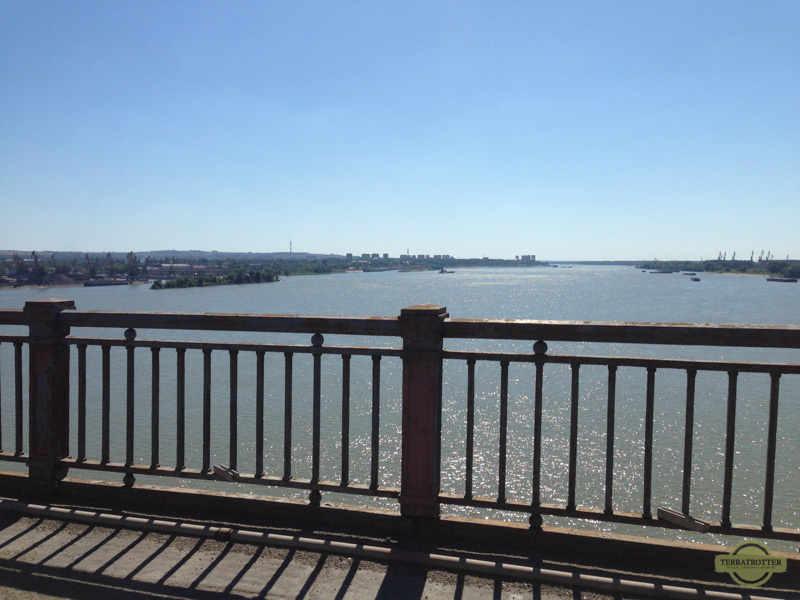 Today we finally reach the border of Bulgaria, located on the other side of the Danube River. Most of our 3-day mammoth drive is now behind us. 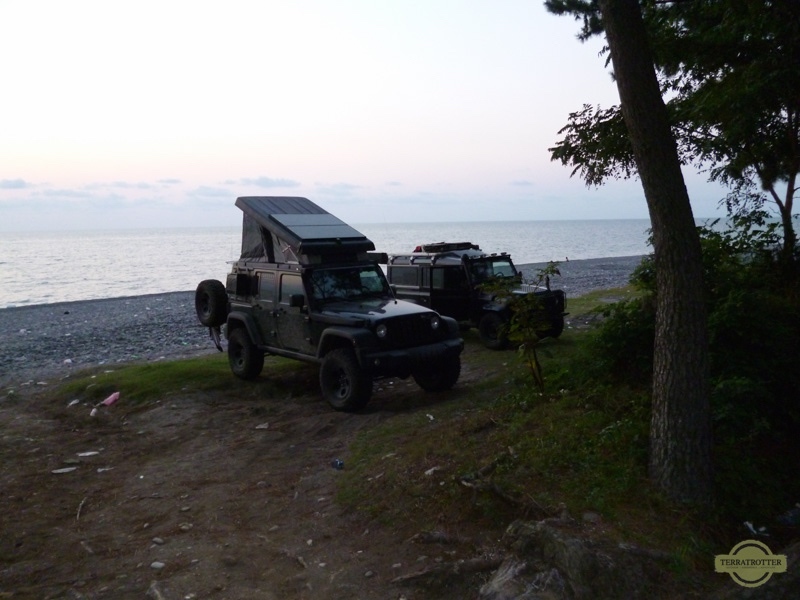 We reach the beach camp in Silistar (1hr from Burgas) minutes before the last sliver of daylight disappears. Camp is set up quickly and with our head torches on spaghetti is being prepared. Add a well deserved cold bottle of beer to this scene and the evening goes by quickly. A day of rest to enjoy the beach and sun. This sounds like the start of our vacation!! Beautiful sunny weather greets us as soon as we open our eyes and off we go to the beach for a morning swim and body cleansing. (Did you know the Black Sea is a nice emerald and blue color, not black?) We spend most of the day with lounging, reading and swimming in the sea. 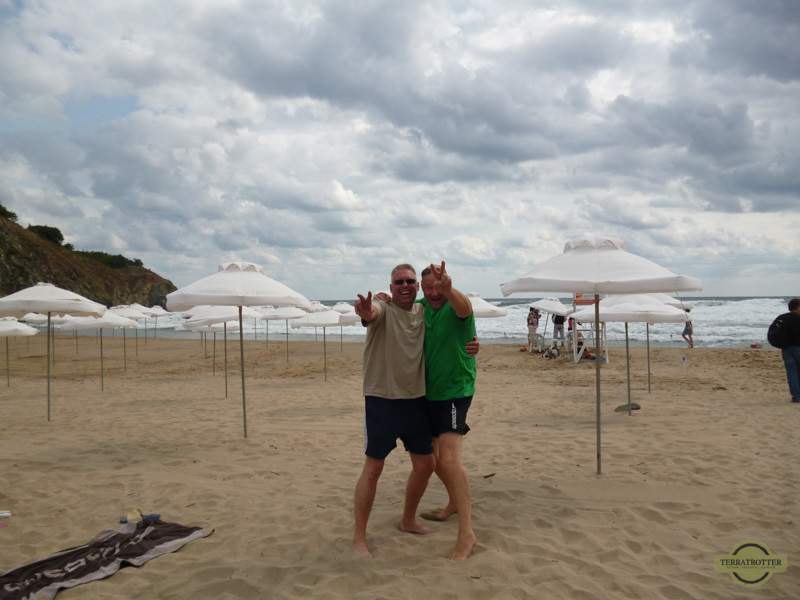 During the evening the beach bar's security guard, called Rosov, comes over for a visit. The awkward thing was that he just appeared out of nothing, carrying a 9 milimeter on his hip. He turns out to be really friendly guy, just a little lonely. We offer him drinks and food. We keep a conversation going by using hand gestures and a lot of laughing. At one point we even make a call to Germany where Michael's Bulgarian speaking friend translates some stuff over the phone. One of the things we found out through this phone call was that Rosov first thought that we were foreign, undercover military securing the border between Bulgaria and Turkey. It seems like a lot of these people are found in this area. Nope not us, just strange tourists. After a lot of laughter, beer and Rakia (Bulgarian Snapps) Rosov leaves us, ready to go to bed....PANG PANG PANG, suddenly we hear three rapid shots!! Maybe not the smartest thing to do, but off we went into the dark to check on Rosov. When we find him he explains he shot a Coyote... nothing to worry. This turns out to be a very hectic day. 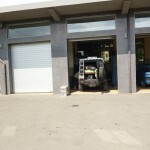 The Defender has a second battery installed on which the compressor coolbox runs. However the battery is dead. After tinkering around to no avail we leave our camp around 11AM. A few towns further we find a replacement battery. By 2PM we are finally set for Istanbul in the hope to still cross the Bosporus and enter the continent of Asia today. But, alas, that wasn't going to happen. Due to the late departure from Bulgaria we are running out of daylight before we have reached our goal. We decide to stay overnight on a camping site close to Selimpasa on the Marmara Sea. Izmit, the grounds keeper, greets us warmly and immediately makes us feel welcome. How wonderful! Based on Izmit's directions we enjoy dinner at an amazing restaurant. We have our own little glass cabin in the restaurant's garden and are taking care of by 5 (if not more) waiters; as if we are VIPs. Our morning sleep is interrupted by the local Mosque… damn, totally forgot about that! Once we are fully awake and dressed, we hit the road again. Before we are even able to see Istanbul we hit a major traffic jam. It takes us hours to reach the bridge that would bring us into Asia, leaving behind the continent of Europe. 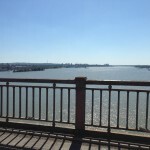 One major goal of this trip is reached by crossing the Bospurus. Quickly the scenery changes from dry flat lands to hills, mountains and forest. 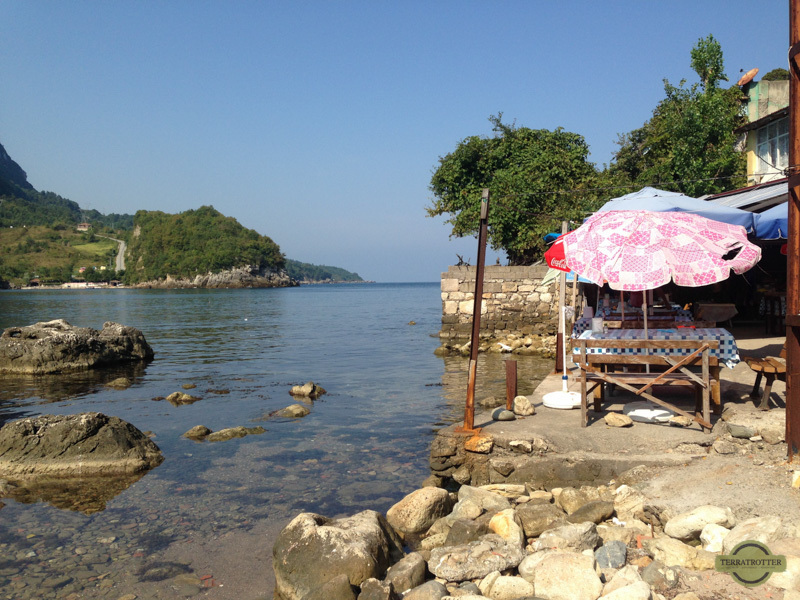 Based on a YouTube video from motorcycle overlanders we try to camp on a beach a couple of kilometers from Amasra. However, when we arrive at the spot we are "welcomed" by a lot of garbage and are soon informed camping overnight is not allowed here. Based on local directions we head to Cakraz instead, where we park our cars on Dolunay Camping (which you can barely call a camping site, more a parking lot with a little less garbage, but made do for the night). The town itself is however quite nice with many restaurants on the main boulevard. In one of them we had a nice fish and Kofte dinner. Tip: Crossing the Bosporus takes TIME, be prepared. If we remember correctly we were in its daily traffic jam for 3 hours. Aside from buying food from the street vendors (see picture above) and watching people, we entertained ourselves with playing UNO on the Ipad. Once again the morning call of Muezzin (three this time) wakes us before we are ready to start the day. We decide to leave the site as quickly as possible to find a nicer place to have breakfast. Later in the day we find a beautiful cove where we have a Turkish coffee right next to the water and enjoy the serenity of the place. However, if we want to reach Georgia in a timely matter we have to hit the road again. So off we go on one of Turkey’s most beautiful roads (Turkish version of the Californian Highway 1). By 4PM and in need of some rest we reach Sinop, one of the bigger towns of the region. Here we stock up on bread and EFES (Turkish beer), since our provisions are depleted. 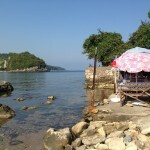 Just on the outskirts of Sinop we find a camping site right on the beach (Marti Camping or Marti Garden). Again, friendly people greet us. On top of that, the site is very CLEAN (I might even appreciate this more than the sea view). After setting up camp, which is very easy to do with the Ursa Minor pop-up roof, we enjoy fish dinner at the camping's tavern. The camping owner is not only a great cook, he also speaks a little bit of English. Tip: Don't forget to bring along a potent mosquito repellent on your trip. Me and Michael got bitten up badly during the night. I will save you from the pictures. Day of LEISURE!!! So nice to enjoy a day off on the beach, without having to drive. We even try some fishing today but fail to catch anything. We probably lack the skills, since there are enough fishing boats on the sea. We fill the rest of the day with reading, sunbathing, swimming, eating, drinking, …… you can catch the drift. By 10AM we are back on the road. Our goal today is to reach Sumela Monestry. We are pleasantly surprised by a four-lane coastal road in excellent condition -- making this a very smooth ride. We reach Sumela Monestry by 5:30PM, which is a must-see if you are closeby. By the time we finish our visit it is getting dark, so we decide to camp in one of the camping sites nearby (Sumela Camping). 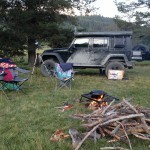 During our dinner, some family members of the camping owners stop by and a very pleasant conversation takes place. We find out that one of them lived in Germany for a few years and we are invitated to a nearby town and to Instanbul. 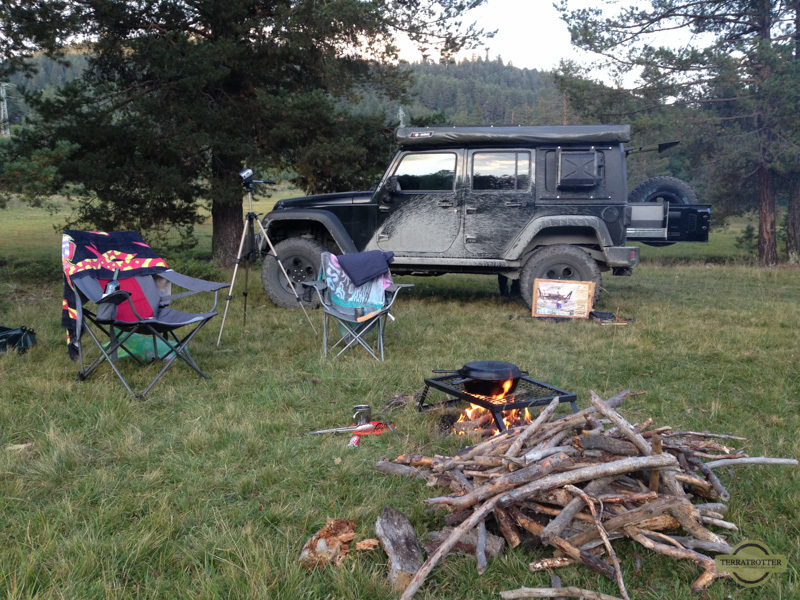 Tip: Negotiate the price of the meals at the camping sites and restaurants in advance. Since these dinners are often off-menu (using sign language and visits to the kitchen) we notice that the bill is sometimes higher than what we expected. Lesson learned (or so we think). 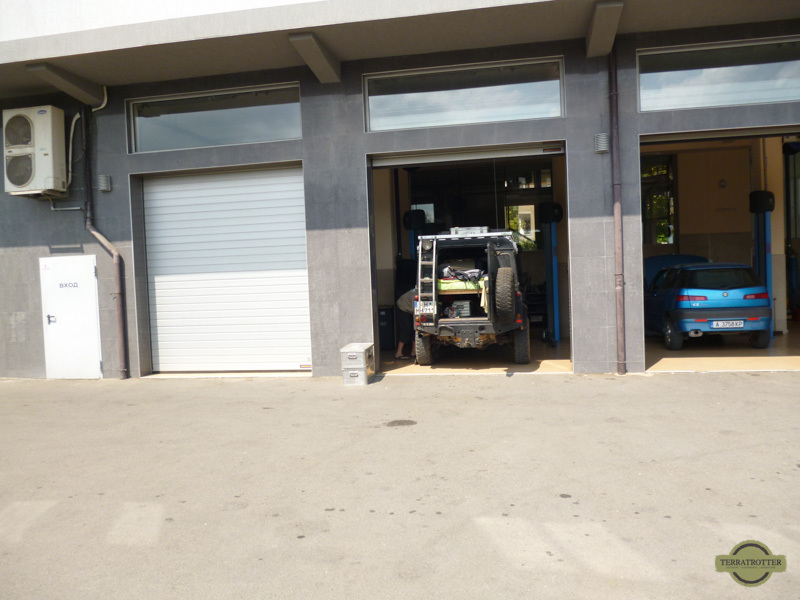 When we almost reach the border of Georgia (Batumi) the Landrover is running very low on fuel. Should we still get some in Turkey or take the risk and wait till we have crossed the border into Georgia, where Diesel is almost half the price? 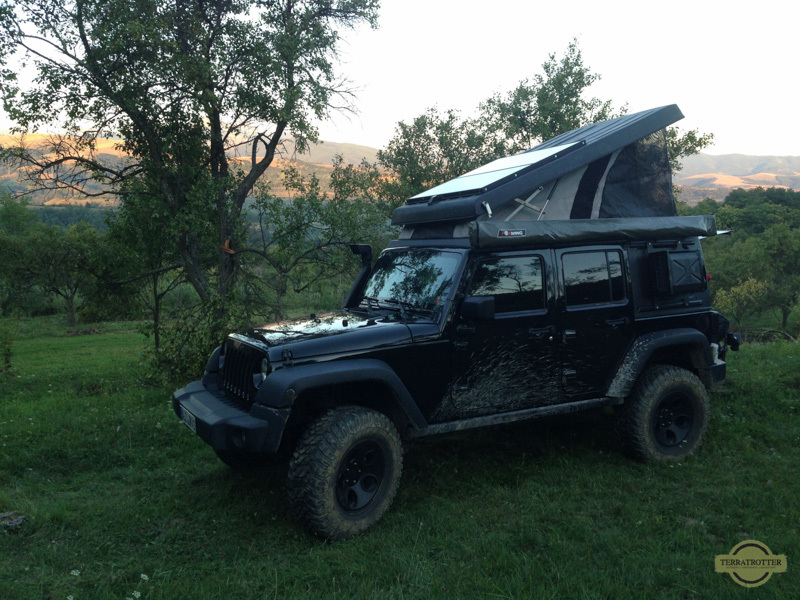 Since the Jeep can still go for 70KM, we hope that luck is on our side and decide to wait until we reach Georgia. 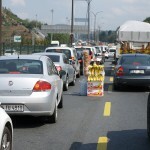 Traffic around the border at Batumi is organized in a rather peculiar way. First, you pass kilometers of semi-trucks, probably waiting in line to declare their goods. Once you reach the end of a tunnel that is located right in front of the border, you are confronted with what seems to be utter chaos. Even though the border control is on the right hand side, a police officer directs us to the left. Since there is not much else we can do, we turn left. Approximate 150 meters further we realize that the line makes a U-turn and heads back to the border. In the meanwhile we also observe passengers using public transport (Ford transits) crossing the border on foot. Finally, we make it to the checkpoint. Georgian officers take our pictures and give us an okay to enter the country. Next, we make our way through Batumi. The first experience with the “almost lawless” and hasty driving of the Georgians might be overwhelming, but once you realize that one lane easily becomes multiples lanes, you find your way trough traffic. We also notice that we no longer see a mass of unfinished buildings and uncontrolled garbage, as we did in Turkey. Buildings and roads in Georgia are mostly old, but they are used to their full potential. Once we leave the lively city behind us we follow the sea-road and are met with subtropic plants and costal tourism. 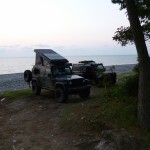 We decide to bushcamp on a beach near Tsikhisdziri. Even though we are confronted again with litter, the amazing temperature of the Black Sea, a campfire and lamb from the grill provide us the ingredients for a wonderful night. Note: In Butami we bought a red spicy paste at a street vendor (see picture). We added to all our stews and pasta dishes. It just tasted so delicious. Alas, we were not able find it anywhere else. We only have a picture of the person who sold it to us. The slow rolling waves crashing onto the beach and a view to die for makes waking up just a fantastic experience. This kind of wake-up call amazes us every time. As such we take it slow this morning and enjoy a refreshing jump into the Black Sea. 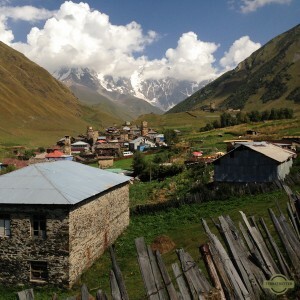 When we are able to leave this great place we make our way to the Caucasus mountains. Following a reservoir, which has amazing emerald colors, we end up on a new concrete road; what a rarity. As such we reach Mestia in good time, where we take our time to walk around. 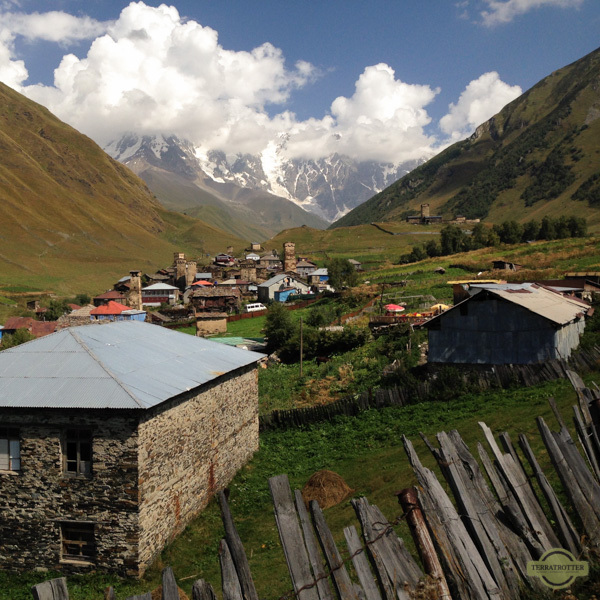 We continue our road to find a bushcamp.continue following the road (track) to Ushguli. That the road is “bumpy” is an understatement. Many times we ask ourselves how the Georgians manage to keep their cars alive on these roads. Every time we think "no 4x4 should drive here", a regular car (most of the time a Lada or Ford transit, but also fancy once like BMW’s) tries to surpass us. Corners, bumps, cows, holes, …. nothing seems to slow the Georgians down.The road is also well traveled by backpackers, thus we give two of them a ride. The whole way up, as we do on so many roads in Georgia, we are mesmerized by the beautiful nature that surrounds us. We drop the backpackers of in Ushguli and have drinks on the terrace of a little bar, where we take in the amazing view of the Glacier. If only we had more time to explore this country. We start to dream of traveling slower. We spread out into different directions to follow some tracks to find a camp. Through CB we keep contact and that his how we are informed that Michael found a spot. Wow! What a place, grass, trees, a little stream… and a view to Russia. The border is only 10Km away. First thing we do is collecting firewood, which there is plenty of. As a well-oiled team we get things done in no time: One gets the fire going, one sets up camp, the others start cutting up meat and veggies… With the grill over the campfire we cook for the first time with the dutch oven (Potje). Cooking with a Dutch oven is easy: Everything is put into the pot simultaneously and a little water is added. After one hour of simmering everything is ready. This is for sure the best bushcamp meal we have ever had!! In combination with a couple of beers and staring at the fire we are getting happily tired and of we go for a good nights sleep… you would think. Tip: In Georgia you have to keep your eyes open for potholes, a one lane turning into multiple lanes and drivers still overtaking other cars when approaching blind turns. Shortly after we drift of into sleep it starts to rain -- nothing to worry about. However, the rain turns into a major thunderstorm! Left and right from us lightning strikes, followed by the loudest thunder we have ever heard. It is so bright you could read a book and it just keeps on going. Not funny for Elmer, who has a full bladder from too many beers. But the worst part comes the next morning when we are sipping from our coffee. The other two didn’t hear or see a thing!!! We know for sure they didn’t smoke anything, and it was for sure not toooo many beers we had, but they slept through the whole inferno. We continue our ride in the direction of Lentheki. The "road" becomes worse and worse and we encounter no other traffic. This is making us suspicious. And yes this turns into another amazing off-road experience. At some point we stop at a spring to fill up our depleted water supply. This is however pure Iron water and thus not very tasty. After hours off-road driving, mostly in low gear, we know we are not going to make it to Lentheki this day. 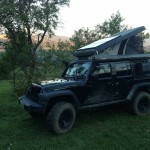 We start to look for another bushcamp in the high Caucasus Mountains. I find a perfect spot on a piece of land right next to, but far enough from a fast flowing river (another hint that there has been a storm the night before). To reach this spot we need to cross a muddy side flow of the river with low hanging trees. Low gear is selected and I point the Jeep into the mud. We pull through easily as does the Land Rover. Camp is setup and firewood collected. Just before dawn some cows stride by, guided home by a woman and two Cocker Spaniels. Rain starts again and the Foxwing provides the much needed shelter. Tired due to lack of sleep from the previous night and a long day driving we are off to bed shortly after nightfall. We brew a quick morning coffee and decide to get some extra off-road km’s behind us before having breakfast. Funny enough the "road' actually gets better a few km’s away from our camp. 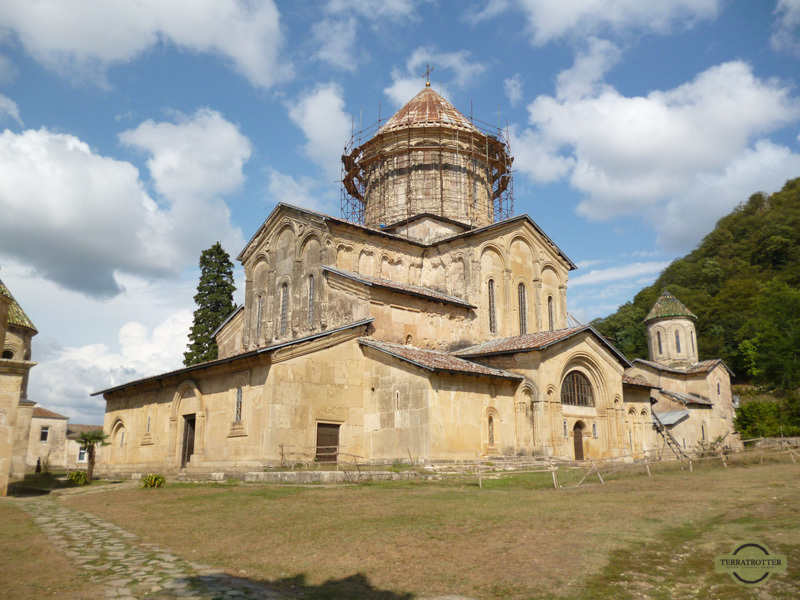 We pass Lentheki shortly after and make it to Kutaisi where we restock our depleted stash of food and water. Ok ok, beer as well. 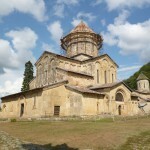 Near Kutaisi we want to go visit the nature park where Dinosaur footprints are to be observed. After a off-road shortcut we make it to the entrance of the park only to find out it is closed. Thus nothing else to do than to have our breakfast right there, which is now more like brunch, and to turn around to go see one of Georgia’s most beautifull Monastries, Gelati Monastery. There we "crash" our first Georgian wedding and try not to stare at its dressed up entourage. As we are looking around a lady approaches us. The ladies husband used to be a guide at the place and somehow she took over that job after he passed away. She showes us around and explaines in German the very interesting history of the Monastry. She even opens old locked doors, otherwise not accessible for visitors, to have us standing in a little church inside the main church where we admire some old beautiful murals. 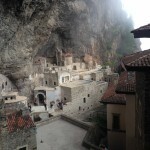 After our visit to Gelati Monastery we keep on driving north in the direction of Tkibuli. Supposedly this is a wine region and since we heard that Georgien wines are very tasty we definitely want to buy some and why not in the main wine region when you are there. And this is exactly what we do, even though we actually haven’t seen any vines. They must be growing them on the other side of the mountains we think. Let's leave the tasting for tonight. Once again, we find a gorgeous bushcamp. This time at a secluded cove of lake, found by Elmer who loves to climb up tracks through underbrush. Also the 4x4-cars have no problem getting up the steep track and down into the cove. Too bad we are too slow to take a picture of a cute pig bathing in the water. While setting up camp we realize we left all the collected fire wood on the other side, but nobody feels compelled to walk back and get it so no fire this night. Luckily the temperature is really nice. Michael and Udo decide to try out the fishing rods, but have no luck. Micheal is doing kind of okay and Udo gives up after he nearly caught himself twice with the hook. Since I had fished before I do my best to explain the three guys how to -- luckily for the guys it is a secluded cove… When they try to forget what just happened with the wine we just bought, they quickly switch back to beer. Nope this can't be the wine we have read about. We are already two weeks on the road. Crazy how time flies. Ananuri, on the Georgian Military Highway, is our next stop. The main road there is in good condition. We decide to stop at Gori to find a restaurant with Wifi so we can contact our family through Whatsapp & Skype. Gori, aside from being Stalin’s birthplace, has not much appeal to us so we leave it shortly after we have lunch. We get on the the Military highway (starting just north of Tblisi) and follow it until we reach Ananuri. Upon arrival, we parked our cars on the parking lot right on the waterfront next to the monastry. The water is the right temperature to enjoy a swim. We also meet with a group of Israelis on a guided tour and get introduced to their enthusiastic call "Yalla yalla", which we will use frequently on the rest of our trip. 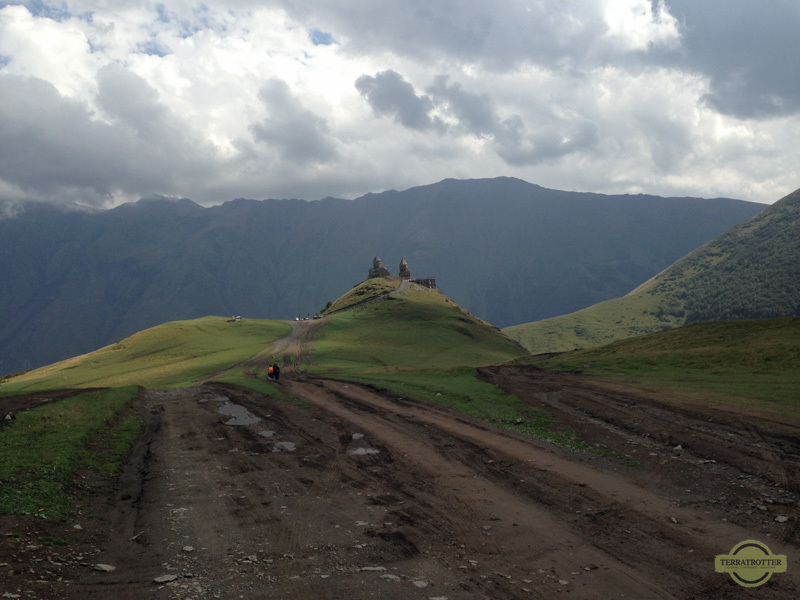 The highlight of today is the visit of the Gergeti Trinity Church under Mount Kazbegi , which can be reached by foot, 4x4 cars, or a sedan if you are a Russian national. On the top of the mountain, where the church is located, a local SUV gets himself in trouble in the mud. With the help Michael's Defender he is pulled out in no time (Yes, we have it all on tape). As a thank you, Michael receives a bottle of homebrew Schnaps. Mmmm very potent stuff but tasty. The local also tells us about his "restaurant" where we later that night enjoy our dinner. Too bad, we hadn't negotiated the price in advance and are confronted once again with an overpriced bill. Later that night we bushcamp approx. 300 meter from a military camp in Ketrisi valley near Kobi (it was too dark to try to find another place). An old lady comes by and greets us -- we assume that we are parked on her property, which we mistakenly thought to be abandoned. She is a little surprised to find us here and tries to figure out where we will be sleeping. When she invites us to sleep in her own home, we try to politely decline the offer by showing where we will be sleeping in the cars. Although it is not the most relaxing place to sleep (but this could be due to the cold and rainy weather), we thank the old lady the next day with some chocolate we have in our fridge for these kind of occasions. We didn't get to composing "Road trip to Georgia - Part 2" yet. Hopefully one day we will. We did Georgia in 2015 with Unimog. Visit http://www.mm-unterwegs.de to read and look for more. Hopefully one day we can visit the other side of the Black Sea. We are curious how you guys experienced Georgia in a Unimog. We already put your post on our reading list.